The 4th generation MG Squared camera junction box is a two piece clamshell design, with one hinge side and one latch side. This provides an easy access point for wire terminations and other connections between mounted equipment and the lowering device connector leads. The interior of the box offers ample space for surge protectors. The general shape of the box is cylindrical to minimize the EPA. 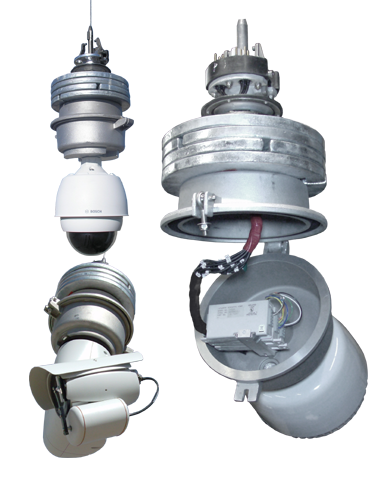 The bottom of the junction box is provided pre-tapped with a 1 ½” NPT thread to accept industry standard dome housings and can be factory or field modified to accept a wide variety of other camera mountings.